The Soaring Sheep: So much for being organised! I'd been rather smugly congratulating myself on my organising skills and how productive I was being. I've almost finished Mr Soaring Sheep's first sock, I've knitted some more of the colourwork cardigan's first sleeve and I've done some more squares for my blanket. I figured I'd get the socks and cardigan finished in the next couple of weeks, cast on a scarf for my Dad and be all ready for the Booknits MKAL starting October 31st. Then I got an email from ravelry. It was the first clue for the MKAL. It starts today and FINISHES on 31st October. I'd completely muddled up the dates in my head. I hadn't even wound the yarn or ordered the beads I was looking at. ARGH! 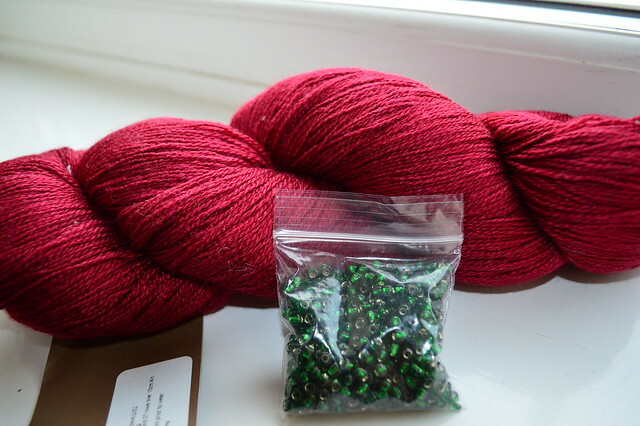 Dark green beads with a silver lining to go with the Fyberspates Scrumptious Lace in Cherry. I know the saying goes "red and green should never be seen" together but I rather like this combination actually. I'd better stop waffling now and start knitting! Boy that cherry is beautiful! It's rich and perfect for Fall and Winter.